That was the margin for both Catholic League boys’ basketball semifinal contests Wednesday night, Feb. 21 at the Palestra. Led by a balanced scoring attack and aggressive defense, Bonner-Prendergast defeated Archbishop Carroll, 48-45. 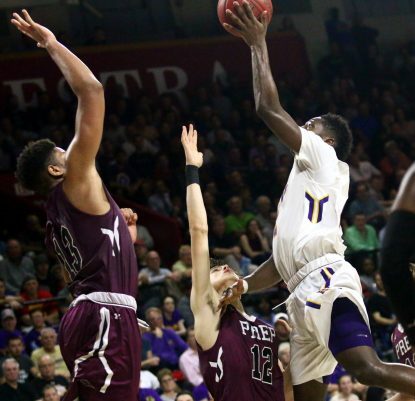 A few hours later, a second-half comeback propelled Roman Catholic past St. Joseph’s Prep, 69-66. 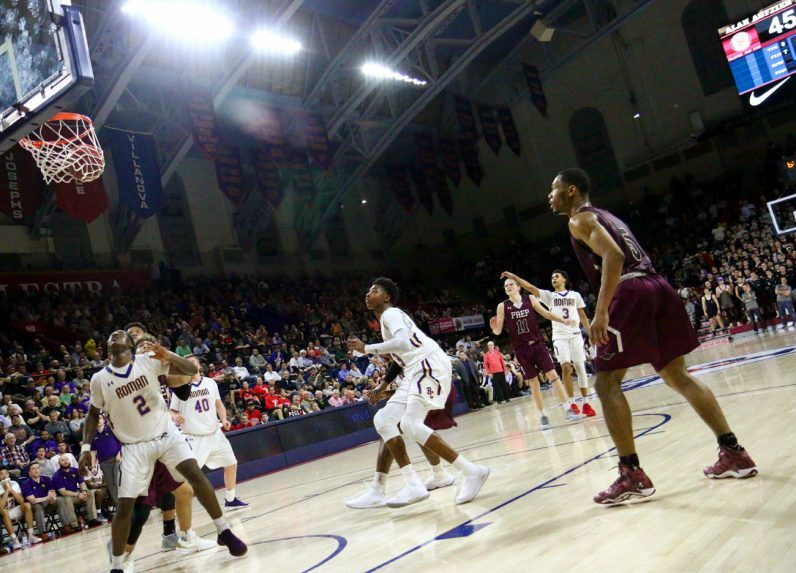 The Catholic League championship is set for Monday night, Feb. 26 at the Palestra. 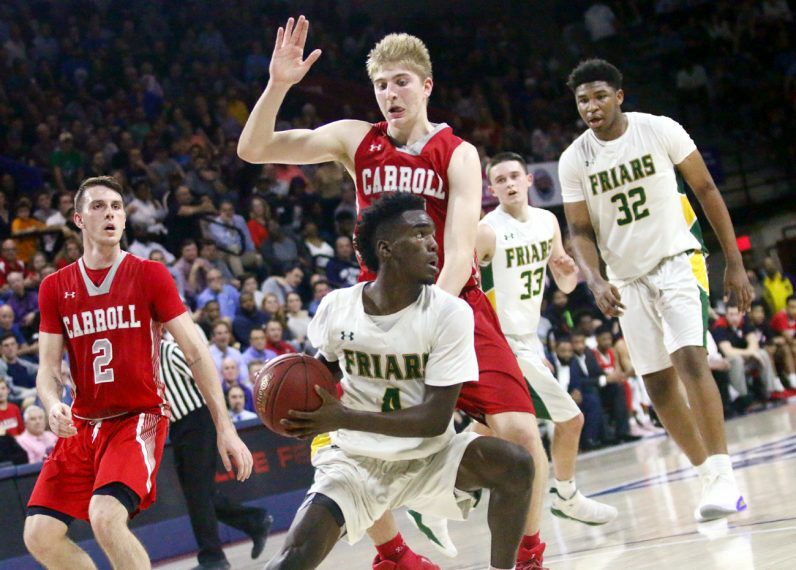 After Neumann-Goretti and Cardinal O’Hara battle for the girls’ title, Bonner-Prendergast and Roman Catholic will do likewise for the boys’ honors. Bonner-Prendergast’s Ajiri Johnson dunks the ball with Carroll’s Keyon Butler on his heels. The top-seed Friars (21-3), looking for their first CL title in 30 years, almost relinquished a commanding 42-32 lead with 5:31 remaining in regulation. Fourth-seed Carroll (17-7) used seven straight points by senior Kyron Butler (15 points) to climb within 46-43 with 46.5 seconds left. A bucket by sophomore A.J. Hoggard (13 points) closed the gap to 46-45 with 31 seconds remaining. During an interminable final half-minute, Bonner-Prendergast struggled at the foul line (2 for 5) and Carroll turned the ball over on four straight possessions. Junior Tariq Ingraham (10 points), junior Mike Perretta (nine points, 10 rebounds, three blocks), senior Ajiri Johnson (eight points, nine rebounds), and sophomore Donovan Rodriguez (eight immense fourth-quarter points) provided most of the offense while senior Yohance Garner’s only points, a three-pointer with 5:20 left in the third quarter, gave Bonner-Prendergast a 28-26 lead, one they would never relinquish. The Friars will take on Roman Catholic, a team they defeated in overtime, 68-66, on Jan. 19. The Cahillites (18-5), a third-seed whose only two losses were by two points to both Bonner-Prendergast and two-seed Neumann-Goretti, used a 22-10 third quarter to turn a 24-20 deficit into a 42-34 lead. In the fourth, seventh-seed St. Joseph’s Prep (17-8) fell behind by 56-41 with 3:45 remaining but stormed back behind senior Kyle Thompson (25 points), senior Darius Kinnel (19 points), and junior Trevor Walls (10 points) to close within 67-63 on a trey by Kinnel with 15 seconds left and 69-66 on three-pointer by Thompson. But without any timeouts, the Hawks were helpless to stop the clock as the remaining four seconds ticked away without Roman needing to inbound. This latest victorious script is nothing new for the Cahillites. They have been behind in numerous games, most recently by 15 points to La Salle in the quarterfinals. But Roman seems fearless. 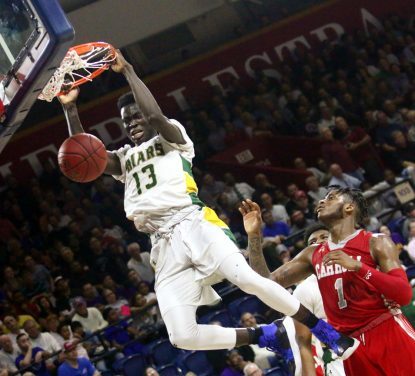 Griffin’s positive energy, said several players, is one of the major reasons why the Cahillites, who are aiming for their third championship in four years, maintain balance whether ahead or behind. Griffin is quick with a pat on the back and often offers words of encouragement regardless of the circumstances. About 30 minutes after the game, Griffin was standing with several friends near the north basket and was periodically approached by different reporters who often repeated the same questions. The gracious Griffin didn’t flinch. Sophomore Lynn Greer III (17 points), junior Seth Lundy (14 points), junior Hakim Hart (11 points, 8 rebounds, 4 assists) and senior John Kelly (seven points) rounded out Roman’s scoring. For the Prep, senior Ed Croswell collected nine points, 11 rebounds and three blocks.